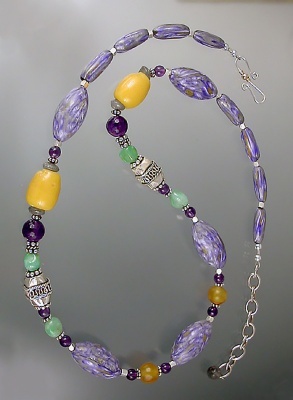 Designing this necklace and making the lavender floral beads kept me busy for the better part of a week. Studio-made polymer beads, vintage yellow glass, green chrysoprase, amethyst, serpentine, and Sterling silver. Length is adjustable from 20" to 22".